The combined forces of the Internet and cloud computing are dramatically changing how software companies deliver their functionality, and this is clearly impacting—some would say transforming—how end users do their work. Today, web connectivity coupled with elastic cloud computing is giving users far greater reach and more flexibility in almost every field. The benefits are compelling: users can easily and inexpensively access an immense wealth of geographic information on almost any subject and leverage cloud computing resources to perform analysis and mapping. They can also easily share their data and combine it with other shared data in lightweight apps, fostering community and collaboration. These forces are revolutionizing geospatial software and delivering many benefits to our users—and my sense is that this transformation is just beginning. 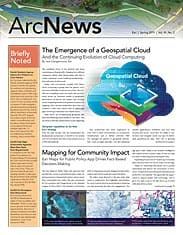 Over the past decade, Esri has transformed the fundamental architecture of ArcGIS to be entirely web services based. We refer to this architecture as a Web GIS platform. This architecture has been engineered to work well in cloud environments, in on-premises infrastructure, and in hybrid networks. Web GIS manages all aspects of geospatial information—such as maps and data—but also analytical models, applications, workflows, and even data security and access. Users have the ability to easily share and integrate nearly any type of distributed georeferenced data. Web GIS is growing rapidly as well and is significantly easier to use, deploy, and integrate across the enterprise than traditional systems. This pattern was deployed at scale with the creation of a massive geospatial cloud platform known as ArcGIS Online. The software-as-a-service (SaaS)-based platform provides hundreds of analytic and visualization capabilities delivered in easy-to-use apps. There are also tens of thousands of ready-to-use datasets and maps that users can immediately employ in their applications. This platform is opening up many new markets and enabling existing GIS users to expand their impact across their organizations. The ease of use and affordability of this platform are attracting many new users, from fieldworkers and executives to software developers and data scientists. The open and scalable nature of this platform is also integrating the whole world of data science, artificial intelligence (AI), and machine learning. Using this web pattern is easy, productive, and fun thanks to a whole suite of out-of-the-box apps that run anywhere. These apps just work, supporting things like smart mapping, field data collection, location tracking and routing, spatial analytics, situational awareness, and map-based storytelling. Apps are increasingly how people explore and understand maps and information. They deliver an immersive and “sticky” experience that people find joy in using. 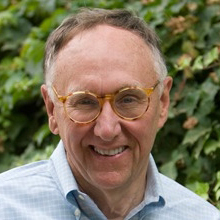 Esri will continue to create both software and SaaS products to help users do their work. Our offerings are also designed to operate in hybrid environments (software and services). The advantages of cloud-based offerings include scalable computing, storage of large datasets, big data computation, and the ability to surge resources during critical events such as disaster response. The cloud can make nearly infinite computing resources available to scale up queries and tackle operations within minutes rather than days. The analytical problems we are being asked to address are scaling up as well with larger datasets and inputs from an increasing array of sensors. Tackling these challenges will benefit from leveraging these cloud resources. 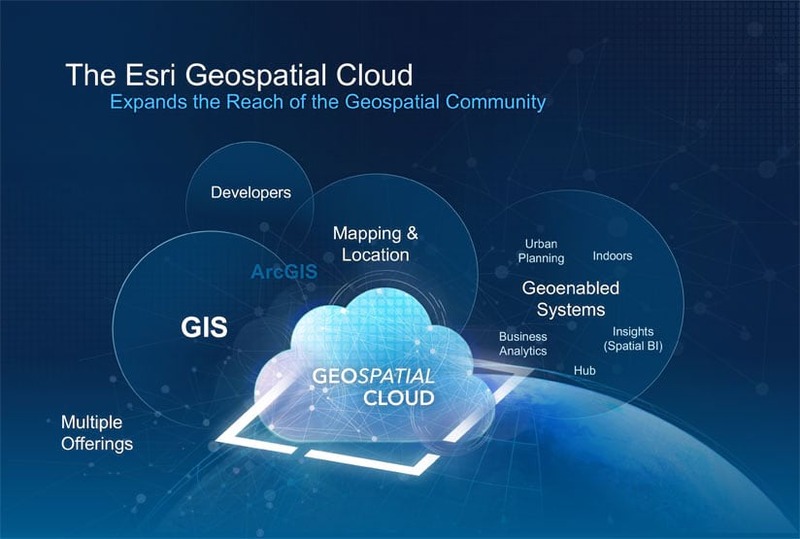 The Esri Geospatial Cloud represents the larger set of technology and products offered by Esri. Our geospatial cloud strategy allows for the quick integration and analysis of large datasets and imagery, often at the scale of cities, regions, and even the world. Here, the combination of advanced spatial analytics and new AI tools can help model and visualize complex patterns, relationships, and situations. Most of today’s real-time and big data problems are inherently geospatial. Examples include Internet of Things (IoT) sensors; devices such as smartphones; social media; vehicle sensors; cameras; and imaging sensors on drones, airplanes, and satellites. Real-time IoT streams are particularly interesting when presented as maps. They can provide instant context and understanding of the data when displayed dynamically as spatial dashboards. Spatial triggers can also be useful for real-time responses. 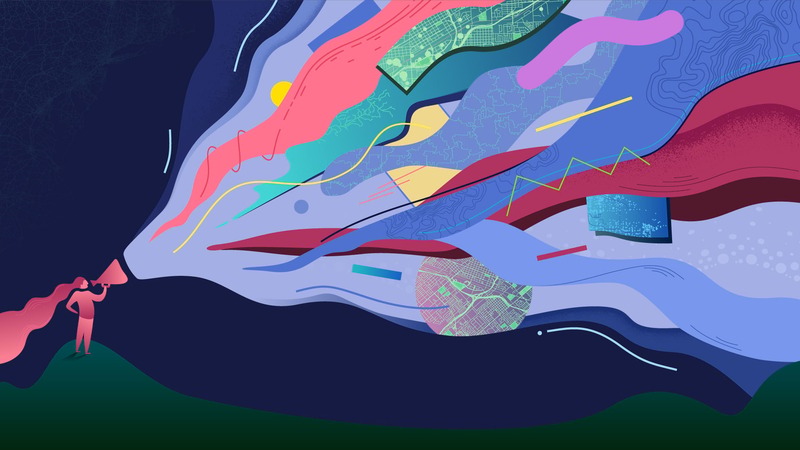 While the computing requirements for this real-time situational awareness can be demanding, the Esri Geospatial Cloud has been engineered to easily scale so it stores billions of records that users can query to ask complex questions and perform location analytics. The geospatial cloud can also be a framework for powering AI algorithms running against data stores to automate processing and reveal insights. This architecture is a gateway to using AI services to understand and solve problem sets related to classification operations; spatial pattern detection; and, ultimately, predictive modeling. Data scientists are using this analytics, visualization, and open science platform to integrate all the leading open science tools into a geospatial framework. Esri’s ArcGIS architecture continues to evolve, providing new and flexible patterns for delivering geospatial capabilities. We are seeing our users deploy more lightweight applications that combine a variety of analytical functions and data services to tailor specific user-centric solutions. In the past, data may have been tied to a specific app. Now, using web services, the same dataset can be used in multiple mapping, visualization, and analytic applications, providing whole new dynamic insights and understanding. All this capability is being brought together to create complex solutions for problems such as ride sharing, space-time optimization, and business-focused supply chain optimization. Esri’s Geospatial Cloud includes wide ranging capabilities, empowering almost any organization with increased spatial understanding. 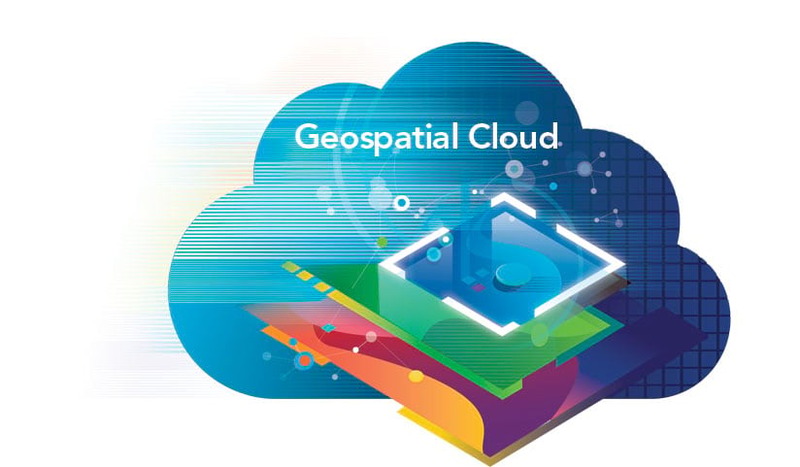 Through the geospatial cloud, access to services and the underlying data can be managed, secured, and maintained at a granular level. Identity allows administrators to preserve role-based permissions in their organizations. Users gain portability with access to apps and maps from wherever they log in. And organizations can set defined roles in configured apps to bring together people and processes in a holistic way and address cross cutting issues. Millions of people around the world are already using ArcGIS Online and making billions of maps every week. Intuitive workflows guide users through mapmaking and give them access to the world’s largest collection of digital geographic information. This combination of data and apps is changing how and where GIS is used. Tailored apps for field data collection are already erasing the boundary between field and office. Companies take these apps into the field to gather up-to-date information and empower fieldworkers to make decisions on the spot. At the same time, office workers can see real-time dashboards of fieldworkers’ measurements and monitor safety with real-time employee location. Esri’s Geospatial Cloud includes wide ranging capabilities, empowering almost any organization with increased spatial understanding. These include business components that turn spreadsheets of addresses into maps that can be used to route users to various locations. Developers can use APIs to build their own apps or embed geospatial capabilities into their existing apps or web pages. New image processing workflows and machine learning algorithms can expedite going from raw pixels to image exploitation and insights. Esri’s Geospatial Cloud also delivers new ways of communicating with interactive story maps that leverage the visual language of geography to express ideas and showcase events. Looking forward, we at Esri will continue to focus on building capabilities that help users be more effective by applying mapping, real-time IoT, imagery, big data, and spatial analytics to their work. This technology will seamlessly integrate our traditional on-premises systems with SaaS and hybrid environments. We see the paradigm of the geospatial cloud as the next big step to empower our users with more options and fewer limitations. Learn more about digital transformation.